EyeWink is a wearable device that allows a user to control his/her smartphone by means of sequences of eye winks and (voluntary) eye blinks. It works by detecting potentials around the eyes through a pair of electrodes, and sending them to the phone, that can interpret these signals as winks and use them as commands to control different apps. EyeWink includes a smartphone app that allows the user to select which apps he/she would like to control with the eyes (for example, the music player or the phone functionality). EyeWink allows the user to control the smartphone hands- and voice-free, hence promoting multitasking and reducing the stress. Other interfaces based on eye tracking or voice recognition require the users to hold the smartphone in front of them or to be in a quiet environment. EyeWink is the only interface that allows interaction with the smartphone through muscular activity from the face, hence being immune to ambient noise and lighting conditions. Moreover, its design makes it suitable not only for people that want to control the smartphone while they have their hands busy, but also for users with severe motor disabilities that could not use the phone otherwise. EyeWink is based on open-source hardware that will allow it to be distributed at a very competitive price, making it affordable for everyone. It is not a device for a small niche of people: it is a unique innovative interface to control the smartphone and, in the future, any device with eye winks. Our team is composed of two engineers doing a PhD on Brain-Computer Interfaces (BCIs), devices that interpret information from brain signals into commands to control an external device. Interestingly, in a BCI you’d like to get rid of any blinks because they affect the actual neural signals you record with it. However, blinks are easy to detect, so one day we thought of using them for something useful instead. With the current technology in electronics, it is not possible to record the tiny EEG signals when a person is walking, but eye winks and blinks are still detectable and, thus, can be used while on the move. We used HackTheBrain UK (the first hackathon for neuroscientists) as an occasion to develop the idea and after winning the event and collecting very positive feedback in the London Science Museum, we decided to bring it to the market. Click was launched by the University of Essex just when we were considering to launch a crowdfunding campaign and looking at different platforms (e.g., Kickstarter and Indiegogo). The University was offering to match the first £1000 and they were also taking care of the fees, so we wouldn’t have to pay to host our project and we would get all the money from the donations. Moreover, the University gave us a lot of support to develop EyeWink both as a product and as a start-up, so we decided to join them in this venture. We think that it is great! 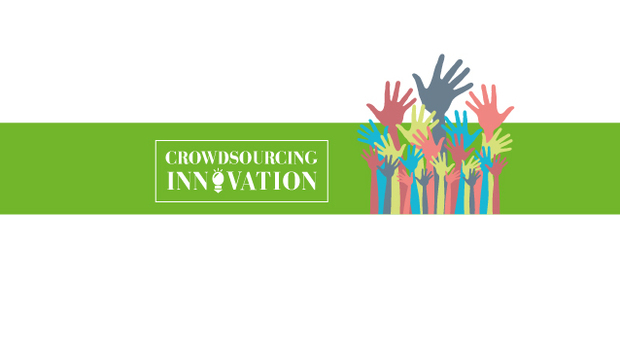 Crowdfunding is a very good way to put your idea in the open and get a first feel of whether the public like it or not. It is great for getting the money that new innovators or small groups need to finish the development of their product without renouncing to parts of their company. It is also great for a start-up looking for seed funding to develop a hardware product (like EyeWink), since it is very difficult to obtain other sources of funding (e.g. private investors) in the initial stages if you can’t show a full prototype of the product. Reactions on Hubbub so far? We started a 5-week long campaign on the 10th of November with the main goal of raising £10,000. In the first two weeks, we reached £2,000 and a week later we reached our minimum goal. We still have two weeks before the end of the campaign, so we are very optimistic. Networking is very important. Attending events, talking about your product to as many people as possible and, in general, creating the “momentum” is vital for the success of a campaign. But also a well-designed video promoting your campaign is very important. It took us around three weeks to design and produce all the marketing materials we needed for the campaign, but in the end the time we spent was worth. We’ve received lots of support from our family and friends, but also from a lot of people we don’t know, and this is exactly the aim of crowdfunding. We also received very useful feedback on EyeWink and ideas for future development. We believe it is very important to stay in touch with the community and learn from them what it is they need and/or want from a device such as ours. We estimate to ship the first batch of our product on June 2016. Then, we hopefully will be ready for large-scale production. How has EyeWink changed since you won the “Hack the Brain” event at the Science Museum earlier this year? When we won Hack the Brain we had developed a first prototype that ran on a commercial board (openBCI). However, the openBCI board is quite expensive and, therefore, not suitable for our goal of an affordable device. We have spent the last few months further developing the Android app to support more commands and to develop a new board designed for EyeWink that could allow us to significantly reduce the cost of the device. What sort of uses have you found for EyeWink so far? As an innovative interface, the applications of EyeWink are many. Our first idea was to provide runners a way to control the music player without using their hands or voice. Then, in the feedback we collected we found other good applications of our device. For example, EyeWink can be used to set the GPS navigator on the car, to control the TV, to make or reject a phone call, to lock/unlock a door or a car, or even to text. Moreover, with the information we can extract from the electrodes placed around the eyes we can infer the level of alertness of a person, so EyeWink could also be used to increase safety while driving. What kind of technology/communication options are currently available to people with mobility impairments, and what sort of difference could Eyewink make to their lives? At the moment, most of the options that are available for people with motor impairments rely on eye fixations, for example through infrared technology, or eye tracking. These devices are usually based on a camera and, hence, require the user to have the device in front of him/her. This highly reduces the freedom of movement and the applicability of them. Obviously, there are also voice options, such as Siri or Google Now, but voice detection is far from being perfect. In addition to this, there are people who have difficulties in speech, so this would not be an option for them. Brain-computer interfaces are now starting to be developed for out-of-the-lab use, but they’re still years away from being as error-free as it would be desirable for them to be used by the public. It is also not clear what the cost of a BCI system will be for the end user. 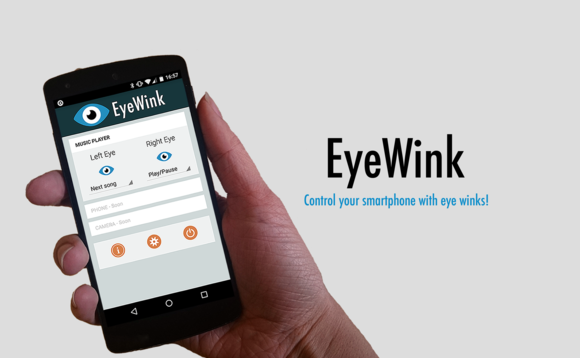 EyeWink provides a hassle-free interface with the phone or other devices, e.g., a wheelchair. The app that classifies the winks/blinks on the phone and assigns them to specific actions is the only one that would know what the person wants to do, as opposed to voice-control alternatives that have shown privacy issues. It is possible to control a keyboard by moving through the rows and columns by means of different eye winks. So we think that our product can have a big impact on people who cannot operate a phone at the moment due to mobility issues. Despite the fact that EyeWink is mainly thought for the consumer market, it also has business applications. For example, companies can provide EyeWink to their employees to improve productivity and multitasking. Public institutions like NHS could also use EyeWink to help their patients to communicate. If we reach our goal in the crowdfunding campaign, we will use most of the money to pay a product designer that can help us design a wearable device in which to integrate the electronics components. Then, we will focus on completing the development of the product in order to be able to reach the market by Summer 2016. Our long-term goal is to use the EyeWink interface with many devices, not only the smartphone. Once EyeWink for smartphones reaches the market, we will focus on adapting it to control a computer (for example, to control the slides in a presentation). We strongly believe that EyeWink will play a main role in the future of user interfaces.